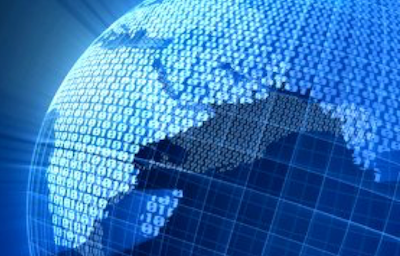 In an outsourced and virtual world many critical operations and data are outside our control. However, supply chain managers need to gain control in order to ensure better outcomes. Lately our inter-connectedness has become a headache for global enterprises. No matter what the positive aspects of globalization are, we do face crime, cyber breaches and uncontrollable supply chain events, from across our business and on the other side of the planet. In spite of all the talk about chains of custody and visibility, we still often don’t know who the real source suppliers are. Recently PBS’s Frontline, Supplements and Safety covered the supplement (vitamins, herbs and ‘power elixirs’) market and showed how diverse and poorly run some of these supply chains are. Many of the product ingredients advertised were not even present in the product, with bulk sourcing of so-called ingredients coming from China; or tainted or contaminated ingredients from poor manufacturing practices. Cyber security challenges both our physical and information supply chains. Recently an important research project by the University of Toronto, Seeing Through the Cloud examined compliance data security and privacy (Canadian law is more stringent than the US) and found that, yes, it does matter where the servers are. Companies that outsource their data and systems may be less secure when the servers are in more porous countries. Further, they recommend actually changing the routing of data to within secure environs1 rather than indiscriminant web routing of your data. As more and more users adopt ‘freeware’ or promotional free services often from organizations who offer ‘free’ to build market presence, yet financially are not profitable, users and their organizations have no control over the quality and depth of data security practiced by these organizations. We also live in a world of exploding endpoints and apps to connect to. Ask yourself, is this site really secure? What practices does this app vendor have to ensure that their software is—and will be—secure? The broad use of outsourcing of manufacturing, logistics and data management often means that no risk officer is assigned who is chartered with protecting your products or data. In addition, as companies eschew fulltime permanent hires and rely on contractors, they often expose themselves to additional information risks.2 Traditional outsourcing also exposes product manufacturers to counterfeiting and the most alarming injection of malware into electronic products. Physical supply chains are also cause for concern. De facto, logistics takes you outside four walls and into the wild and unpredictable world at large, which is subject to additional risks due to weather, traffic, political events, manmade and natural disasters. As people, we are frustrated by the problems of the world and are bombarded with data from TV, web, mobile, social, texts and print sources, and at work by email, alerts and systems that expect us to solve the problem de jure. It just seems that our day is consumed dealing with all manner of hard-to-predict-and-control events. It is not exactly like we can get off the grid and walk away from all this. The fact is, we need partners, suppliers, customers—and their data. And they need ours. A large percent of the data we need informationally and from an operational decision-making standpoint exists outside the enterprise.3 In fact, much of that data is beyond any enterprise—customer trends, weather, events and so on—yet profoundly impacts our business. 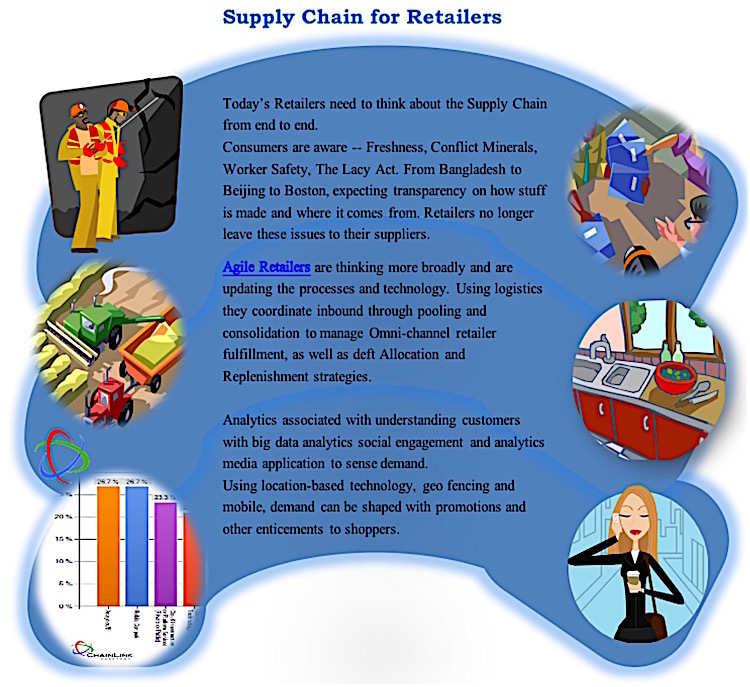 Many supply chain professionals, in pursuit of more insights and control, have been attempting to implement visibility solutions, location-based mobile apps, RFID platforms, control towers, supply chain platforms, supply chain risk management and big data analytics to name a few contemporary technologies. This sure is a new era in technology! Yet these changes will enable us to manage in a new modern way. It will take new skills and investments to make this all come alive and produce the expected value. In this series, then, we will explore the challenges, vision, technology and value as we learn to control the uncontrollable. Supply Chain systems are going through a transformation—a real renaissance—from static historically based systems, to systems with enriched live data about people, places and things. To paint a vision, let’s look at a today and tomorrow view of a global chain. In Figure 1, we show a typical inbound shipment. 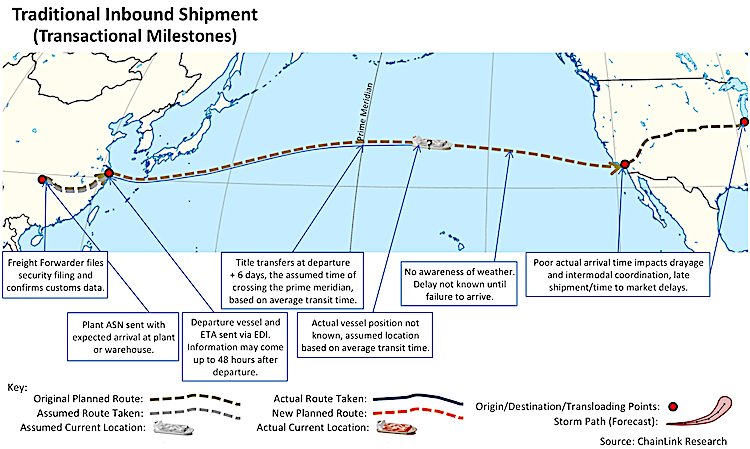 The information journey begins with an Advanced Ship Notification (ASN). Most often customers are unaware of the container and assigned vessel until the shipment has been loaded and left port. Typical information latency can range between 8 to 48 hours. Thus for days, customers often have no idea whether their shipment is delayed or on its way.5 Today, at least, we do have ACE for inbound shipments, so Customs and Security Filings are now being done automatically. The next challenge comes in coordinating port services for drayage and intermodal transfers as well as consolidating, pooling, or making in-transit merges. Customers need to ensure ground inbound coordination as well, so that their own commitments to their customers or meeting manufacturing production plans will be met. In addition, shippers and customers are not aware of the condition of their shipments until they are received. That means that all that effort and expense has already been expended on worthless or damaged goods. Rather, our vision of the future in Figure 2 shows a new approach. 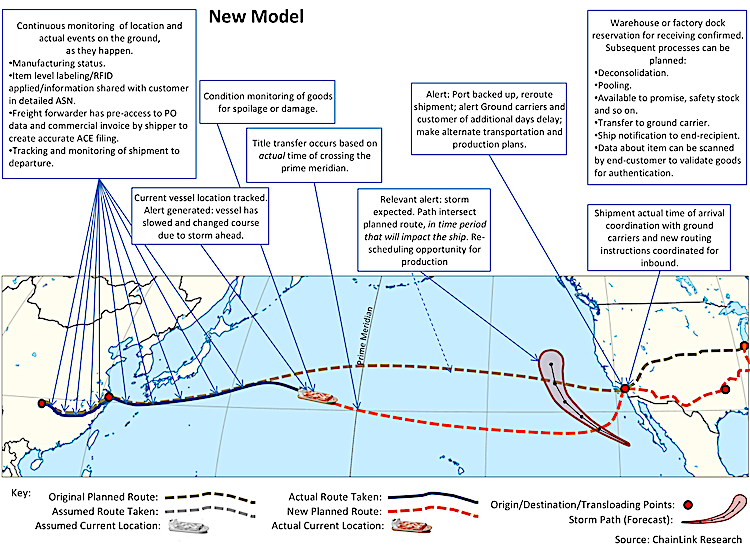 Rather than relying solely on the ASN, the user receives streaming data from the current operational environment—temporal data such as weather or change in route, condition data about goods in motion and time and location, for example. This data can be used by a variety of parties to coordinate changes to routes, alert carriers to coordinate resources and alert recipients of changes in schedules. One can extrapolate this type of vision on the retail side as well. Mobile, geo-fencing, social media and more analytics mining the web to understand shoppers and their needs can produce a rich picture (Figure 3) of buyers in need and on the move. This enriches demand management. To achieve these new states of operations and insights will require a new generation of technology. There is no getting around that. But in the age of Omni-channel and the needs of supply chain transparency, shippers and retailers need to acquire these competencies either through their own systems or from service providers. And the service providers need to step up if they want to retain customers and also earn greater revenue from enhancing their services. in Part Two, Controlling the Uncontrollable, we will look at technology attributes to provide visibility and control. To view other articles from this issue of the brief, click here. © Copyright 2005, ChainLink Research, Inc. All rights reserved.